Gallstones - body, causes, What Does the Gallbladder Do? Gallstones are crystal-like particles that form in the gallbladder when certain substances separate out of bile. Gallstones can vary dramatically in size and the degree to which they cause problems. The gallbladder is a small pear-shaped organ that sits under the liver on the right side of the abdomen. The gallbladder concentrates and stores a greenish-brown liquid called bile that is made by the liver. When a person eats food, the gallbladder contracts and sends bile into the small intestine through tubes called bile ducts, where it helps break down fats in the food. Bile has a number of ingredients, including water and bile salts. Bile salts act like detergent and help dissolve globules of fat. Bile also contains cholesterol, fats, and bilirubin (which is a waste product secreted by the liver, formed by the breakdown of red blood cells). The gallbladder sits under the liver on the right side of the abdomen near the pancreas. When gallstones are formed, they can block the bile ducts, leading to pain and damage to the gallbladder, liver, and pancreas. Gallstones are pieces of solidified bile. The components of bile usually remain dissolved, but when something goes wrong that upsets the normal chemical balance, gallstones can form. There are two main types of stones: cholesterol stones (which account for about 80 percent of gallstones in the United States) and pigment stones, which form from bilirubin and calcium. Gallstones can form when bile contains more cholesterol (or bilirubin and calcium) than the bile salts can dissolve, when a chemical imbalance causes them to crystallize, and when the gallbladder does not contract enough to empty itself of bile on a regular basis. Gallstones can range in size from gravel-like particles to golf ball-sized spheres. Some people have single stones whereas others develop many stones. One in every 10 people in the United States, or about 20 million people, have gallstones. Gallstones are rare in children and adolescents, although anyone can get them. Diets high in cholesterol seem to be linked to gallstones, although some researchers believe that a high cholesterol diet must be accompanied by a genetic predisposition * toward gallstones. Anything that increases the cholesterol level in bile—including pregnancy, hormone therapy, and birth control pills—can increase a person's susceptibility to getting cholesterol stones. Obese people also have a higher risk of gallstones, as do people who are fasting or on fad diets, who may develop stones because lack of food means that the bile sits in the gallbladder for a long time. People with liver diseases, infections of the bile ducts, and blood cell disorders (such as sickle cell anemia) also are prone to developing pigment stones. people who are older than age 60. What Happens When People Have Gallstones? Most gallstones do not cause symptoms; only one in five people with gallstones experiences problems. * genetic predisposition is a tendency to get a certain disease that is inherited from a person's parents. Symptoms usually are felt after a meal, when the gallbladder contracts to secrete bile. If a stone is sent into the bile duct, a person will feel cramping pain in the abdomen that may also be felt in the shoulder and back. Some people experience nausea and vomiting, and some develop jaundice (yellow skin and eyes). 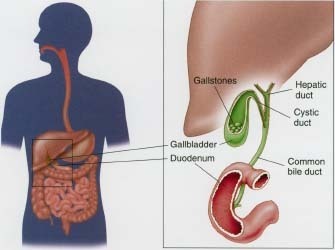 Gallstones can block the bile ducts, and this can lead to damage of the gallbladder, liver, and pancreas * . Gallstones usually are diagnosed only if they are causing problems. To look for gallstones, doctors may use x-rays and ultrasound, a painless procedure in which sound waves passing through the body create images on a computer screen. The standard treatment for gallstones, and the only one guaranteed to cure gallstones permanently, is surgical removal of the gallbladder, usually through laparoscopic surgery (surgery performed through tubes that are inserted into the abdomen through small incisions). More than 500,000 of these operations are done every year in the United States. If a person cannot have laparoscopic surgery, the gallbladder can be removed through an open incision 5 to 8 inches long in the abdomen. People who cannot have surgery, or do not want to have surgery, can take medication to help dissolve gallstones, or they may undergo lithotripsy (LITH-o-trip-see). In this procedure, shock waves are passed through the skin to shatter the stone into tiny particles that may be able to pass out of the gallbladder on their own. * pancreas (PAN-kree-us) is a large gland that secretes digestive enzymes and the hormones insulin and glucagon. U.S. National Digestive Diseases Information Clearinghouse, 2 Information Way, Bethesda, MD 20892-3570. The NDDIC publishes a brochure about gallstones and posts a fact sheet at its website.